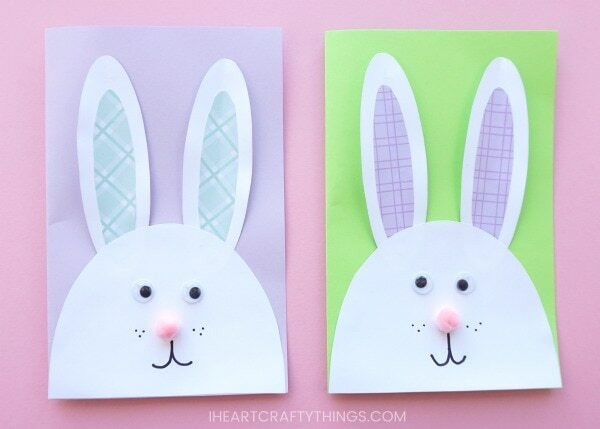 We have the most adorable DIY Easter Card to share with you today. 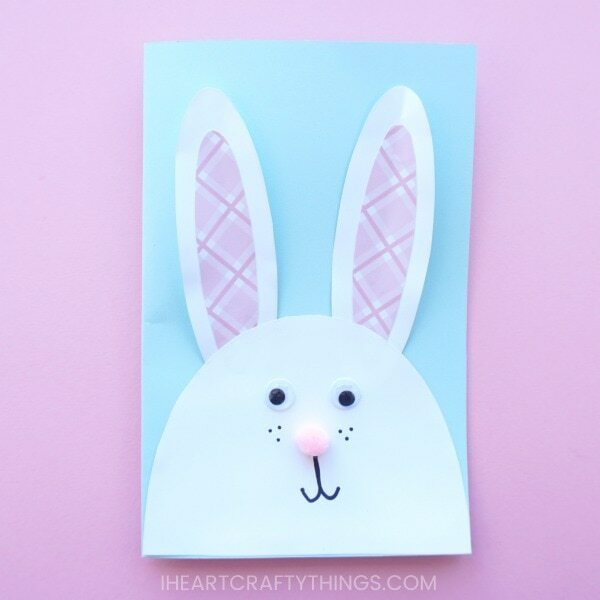 This cute bunny card is especially easy to make with the help of our downloadable template. 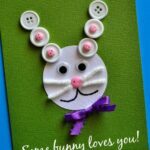 It makes a great afternoon Easter craft and is sure to delight anyone who receives it as a cute DIY Easter Card. DIY Easter Card template <—-Download at the bottom of this post. *We received these products for free from our friends at Oriental Trading. All opinions expressed are 100% my own. 1. Download the bunny card template at the bottom of this post on white cardstock. Cut out the bunny face and ears. 2. 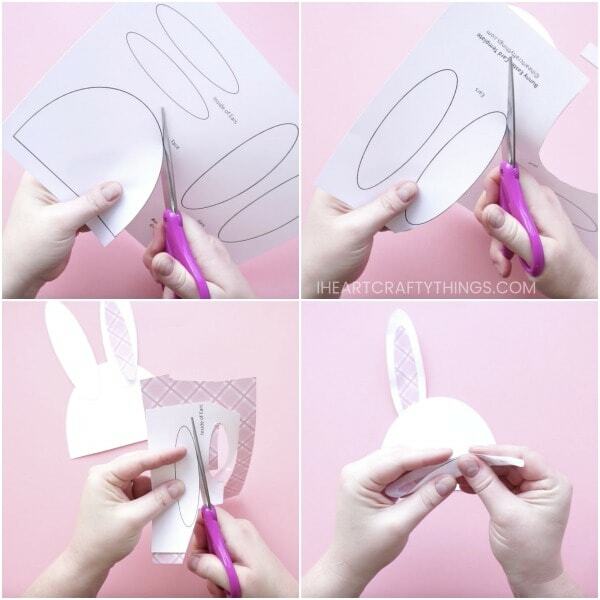 Use the bunny template to cut out the inside of ears sections from patterned pastel colored paper. Then glue the inside ears onto the white ears. 3. 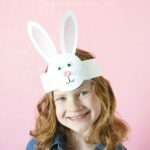 Bend the top half of the bunny ears in half to give them some extra texture and dimension and glue them onto the back of the bunny face. 4. 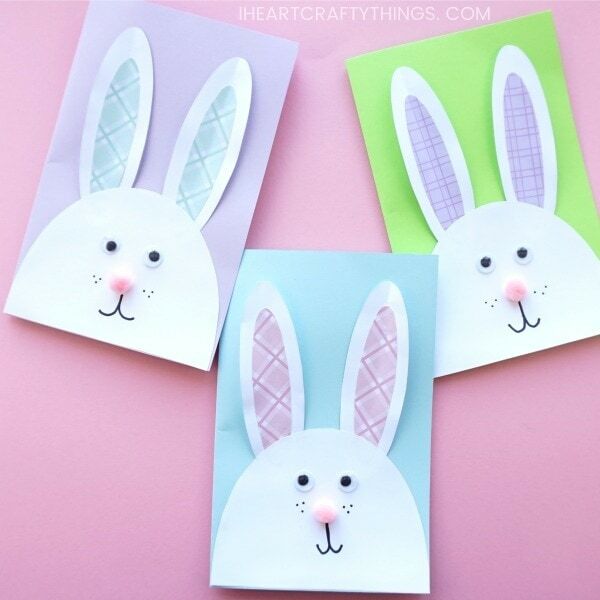 Fold the light blue cardstock in half to create your Easter card. 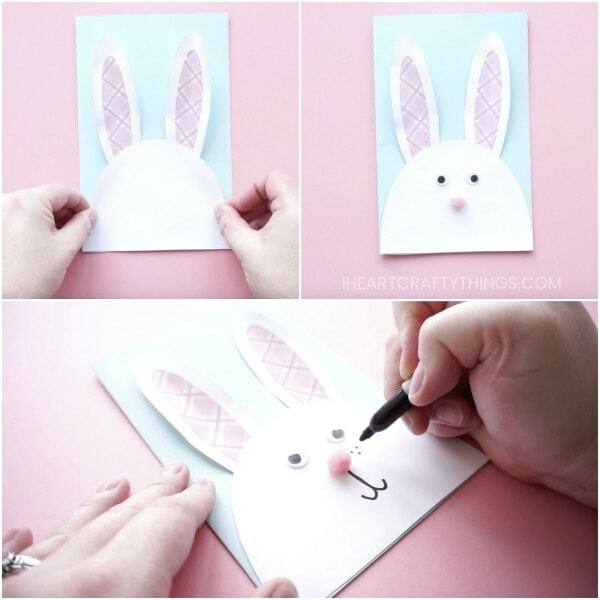 Glue the bunny face and ears onto the front of the DIY Easter Card. 5. Glue a small pink pom pom in the center of the bunny face and two googly eyes. Then use a black marker to draw a mouth and whiskers onto the bunny. Your DIY Easter Card is complete! Open it up and add a special Easter message on the inside for a friend or family member. 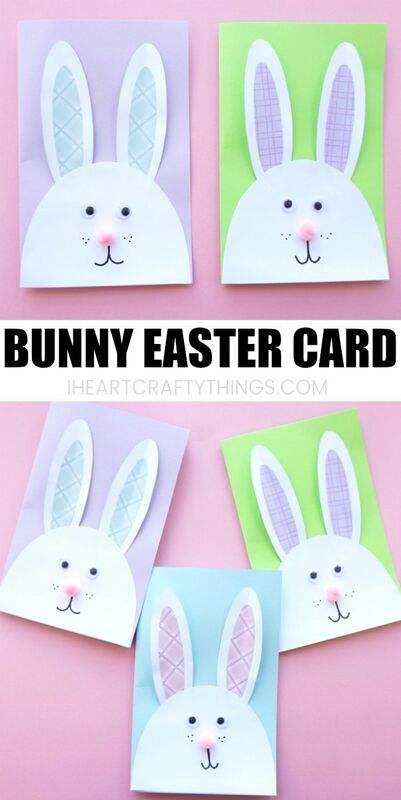 You could also make this as a stand alone craft and connect several together to make a cute Easter banner. 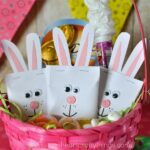 Looking for more fun Easter Crafts? This Tin Foil Easter Egg Art project is fun for kids of all ages! These cute bunny finger puppets are guaranteed to bring fun and giggles to your afternoon. Use some mini craft sticks to create this darling Mini Easter Basket Craft. Enter your email address to join my weekly newsletter and get FREE access to the Easter Bunny Card template! After you click 'enter', a pop-up with the template download will appear. I’m going to try this with my 25 pupil’s class. I know its gonna be a little messy the number is big and they are 5-6 years old probably each of them will need my helping hand, but I’m am all in. Let me see how it goes. Have all the materials ready. Let’s go. I hope it goes well! Thank you for giving our craft a try!